In the old days, observatories, stations and especially watch workshops were equipped with reference clocks, known as “regulators”, which displayed their hours and minutes by means of distinct dial segments. This dial structure, designed to regulate and control the advancing progress of the watches, made reading the time easier and indicated the measurement of time with precision. 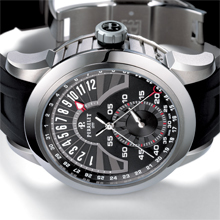 Perrelet is updating its specialised and unique complication in line with today’s tastes with its Regulator Retrograde. This avant-garde speciality, which has been developed and manufactured by MHVJ (Manufacture horlogère de la Vallée de Joux), a sister company, is powered by the P-221 calibre. 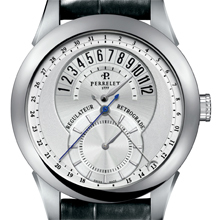 This movement is embellished with Perrelet finishes, which can be admired through the sapphire case back. True to its aesthetical codes, Perrelet has maintained its quality of legibility, while offering a particularly attractive non-conformist display. Time is displayed in an orderly way, since the dial is divided into several segments. An imposing window at 12 o’clock indicates the retrograde hours for a half-day (12 one-hour zones). The minutes are indicated on a disc positioned at 6 o’clock. Anchored to the central axis, a blued steel seconds hand sweeps around the whole dial, while the days hand maintains its daily rhythm. This rare combination of complications, the separate indication of the hours and minutes and the retrograde hour, demonstrate the inventiveness and know-how of the Perrelet company. Connoisseurs who are interested in tradition or enthusiasts or watches with character will recognize the Perrelet signature in the fluting of the sporty titanium or classic steel or gold cases. 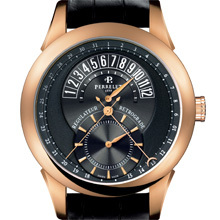 With either option, they will enjoy an intriguing and exceptional timekeeper.